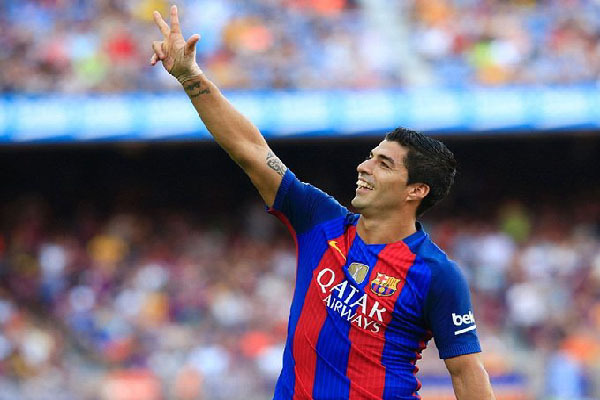 BARCELONA, Aug 21, (APP/AFP) – Lionel Messi and hat-trick hero Luis Suarez were in sensational form as they helped Barcelona start their title defence with a crushing 6-2 win over Real Betis at the Camp Nou on Saturday. Messi scored twice and set up another goal, dominating proceedings, while Suarez added three of his own after Arda Turan’s opener. Ruben Castro struck a brace for Betis but at no stage of the game did it seem like the visitors had enough to prevent Luis Enrique’s team from running amok on the opening day of the new Spanish season. Asked if he was surprised about Messi hitting the ground running this season after the trauma of losing the Copa America final with Argentina, Luis Enrique replied: “No, no. He’s Lionel Messi. He’s always the same. Betis coach Gus Poyet admitted he wished Messi hadn’t been so brutally effective against his team. “As a football fan I enjoyed Messi. Playing against him, you don’t want him to do so well. Messi’s goal destabilised us and from there it is complicated to play football here,” he said. “If you want to go and win the game they will score five or six against you. It happens a lot here. Regardless, it took just five minutes for the hosts to open the scoring, with Turan putting the finishing touch on a fine move. Messi scooped the ball diagonally into the area, finding the marauding Jordi Alba, who cut it back for Turan to prod home. his disappointing debut campaign with Barcelona. While Turan is starting to come to life in a Barca shirt, goalkeeper Claudio Bravo is set to end his time at the Camp Nou, with a move to Manchester City close. Barcelona fans chanted for him to stay as he prepared to defend Ruben Castro’s free-kick, but the Chilean goalkeeper got nowhere near it as the ball flew into the top-right corner. The hosts reacted instantly. Turan had a half-chance to restore Barcelona’s lead but couldn’t direct Sergi Roberto’s raking low cross on target, before Denis Suarez had a strike deflected over and Messi cracked a strike against the crossbar. Eventually Messi put them back ahead with a thunderbolt from outside the box. As he shaped to shoot everybody in the stadium knew what was coming, but there was still nothing goalkeeper Antonio Adan could do to stop it as the Argentine lashed home. Shortly before the break Luis Suarez got on the scoresheet too, when he expertly drilled home Sergi Roberto’s cutback, putting the game beyond Betis, who couldn’t have asked for a tougher opening fixture. Barcelona continued to pile on the pressure in the second period, with Messi twice foiled by Adan, while Denis Suarez had a strike saved too and the assistant referee’s flag stopped Turan from adding to his tally after he bundled home from close range. Then came two goals in quick succession, Messi setting up Luis Suarez for a tap-in, before driving home his second and Barcelona’s fifth from outside the area again. Messi nearly grabbed his hat-trick but Adan pushed a stinging effort away as Barcelona toyed with Betis at will, before Luis Suarez whipped home a vicious free-kick for his own treble and Castro notched a late consolation. Villarreal drew 1-1 at Granada with Sevilla hosting Espanyol in the late game, and Real Madrid and Atletico Madrid in action on Sunday. Zinedine Zidane’s side are at Real Sociedad and Atletico entertain promoted Alaves.